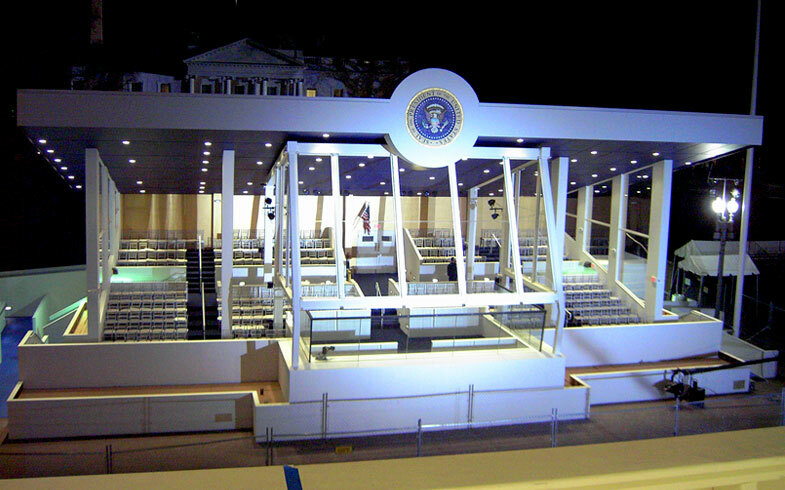 This year marks the 11th consecutive year Heller Electric Company, Inc., has performed and completed electrical work for the Presidential Reviewing Stand, Media Stand and Mayoral Parade Reviewing Stand. For the 2013 ceremony, work on the three separate structures began the week before Thanksgiving and was on a strict deadline for completion by January 7th so the Secret Service could move in. This year, Heller Electric was only allotted ten people to be fingerprinted and undergo background checks, and had an average of eight-nine electricians working 10-hour days, seven days a week. The three-story Media Stand is powered by 800 amps that supplies approximately 96 electric outlets for the media in attendance. With the inauguration, the electric work doesn’t end on the finish date. Four Heller Electric workers man each structure and the materials trailer on the day of the ceremony to ensure all operations run smoothly.